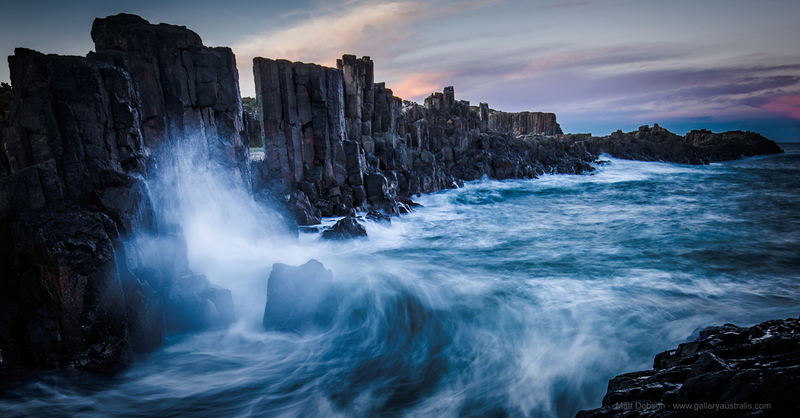 Bombo Quarry & Beach in NSW - Surfing, Fishing & Photography! If you haven’t been to Bombo Quarry & Beach in NSW and you’re a photographer get down there and check it out, you won’t be disappointed. The rock formations at Bombo Quarry give infinite composition options and the way the light reflects off the tall basalt rock formations changes by the minute, especially in the golden hour around sunset. The stroll down to the quarry gives you an idea of what you’re in for with the sharp edges and squares of rock reflecting off the afternoon sun. But don’t have tunnel vision for the water it pays to look around in all directions for photo opportunities. Bombo Quarry shows off just how light has an effect on composition often creating the sort after lines that perhaps wouldn’t be there at other times of the day over a particular subject or formation. Sunflares over the basalt rocks right before sunset. The towering rocks form a barrier from the ocean and the waves crash up against them which creates quite a dramatic effect. While we were there a bus load of tourists were hanging about and a few were sitting on one of the flat rocks when a bigger than usual set rolled in and swamped them, It was was hilarious, I near peed myself. One minute they’re posing about looking cool, pulling duck faces with peace signs, the next they’re standing there soaking wet, winner! You had to be there. But as good as fun at other people’s expense is, it could have easily gone bad and I don’t recommend getting too close especially if you can’t swim. Waves crashing up against the rock towers in the final daylight minutes. Bombo is a bout 1hr and 15mins from Sutherland in Sydneys South. A short drive from Wollongong at the north end of Kiama. You can also get there by train to Bombo Station or just hire a fancy Uber car if you’re stinking rich. Good shoes with ankle support , I wear thongs everywhere and I regretted it (Thongs are flip-flops for the rest of the world’s information, they go on our feet not up our bum). Garbage bag just in case the weather turns (put your camera in it, then back inside your camera bag). Or blow a heap of $$$ and get specially made water sealed bags if you want to be the coolest kid in the quarry. From the carpark at Bombo Beach, New South Wales. I also have a drone but there were too many people there, I only use it when there’s no one else about or at least 30m aways as I have already, nearly given Gerri a haircut with it. Anyway if you have a day to spare and you’re within a few hours of Bombo Quarry, I highly recommend a trip down there, whether for some photography, a surf or just a short stay and around.